One of the world’s most dangerous airports – Madeira in Portugal – almost claimed several planes for itself. Due to strong winds, some of them simply couldn’t land safely, and had to fly off seeking other airports. A video depicts this dance with death. 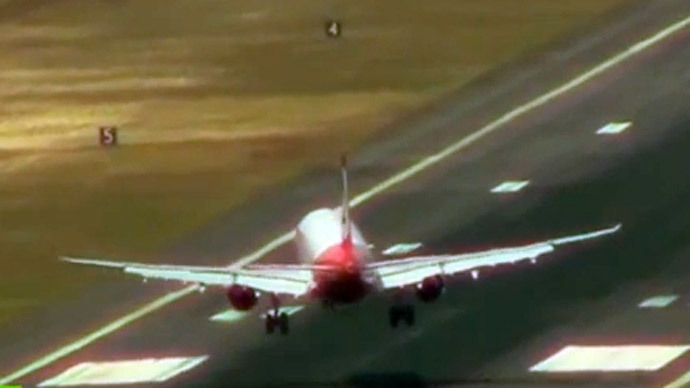 The spectacle was caught on video, with awkward-looking passenger jets having to land practically sideways to ensure safety. Some even had to make several fly-bys before landing. Also known as Funchal Airport, Madeira’s two main runways were just a tiny 1,600 meters (5,250 feet) long, when it opened in 1964. One tragedy of 1977 is a harrowing reminder of the perils of short landing strips: a Boeing 727 smashed straight through a nearby stone bridge, before ending up on the beach. Naturally, the landing strips were extended afterwards by about 200 meters (655 feet). The procedure was repeated in 2003, when authorities had to extend the strips over the actual beach. But the situation at Madeira remains more dangerous than almost any other airport on the planet, according to weburbanist.com's stats – even for veteran pilots. The trick is to distrust your training and do the exact opposite: fly straight into the path of a mountain peak before, in a matter of seconds, steering the plane upwards and over it in order to avoid catastrophe. Only that will set you up for the next challenge – the landing strip itself. To this day, it is very easy to overshoot.